Lieutenant Arex. (Voice by James Doohan). Starfleet officer assigned to the U.S.S. Enterprise as ship's Navigator. Arex was a member of a tripodal species and had three arms and legs. He came aboard the Enterprise in 2269 along with Lieutenant M'Ress, replacing Ensign Chekov who departed the ship at that time. Arex sometimes took the conn, but he rarely left the ship on landing party missions. While under the influence of Harry Mudd's love potion, which had entered the ship's ventilation system, Lieutenant Arex sat as his Navigator's station strumming a double necked lute and humming. ("Mudd's Passion"). On stardate 6334.1, Lieutenant Arex was the first one on the bridge to recognize an alien ship as being an Orion vessel. ("The Pirates of Orion"). On stardate 5275.6, Arex, along with the rest of crew, contracted Dramian Auroral plague and would have died had Dr. McCoy not found a cure. ("Albatross"). In 2270 after the Enterprise entered an anti-matter universe, the crew of the ship experienced accelerated reverse aging and Arex was reduced to infancy. After the starship returned to normal space, the crew were returned to their normal ages by use of the ship's transporters. ("The Counter-Clock Incident"). 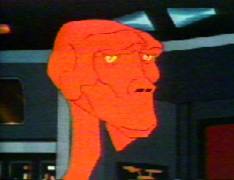 Arex was first seen in "One of Our Planets Is Missing", and he appeared in fourteen episodes, "One of Our Planets Is Missing", "The Lorelei Signal", "The Infinite Vulcan", "Once Upon a Planet", "Mudd's Passion", "The Terratin Incident", "The Ambergris Element", "The Eye of the Beholder", "The Pirates of Orion", "Bem", "The Practical Joker", "Albatross", "How Sharper Than a Serpent's Tooth" and "The Counter-Clock Incident". Although he appeared in fourteen episodes, no background information about Arex was revealed in the animated series, and he was never given a first name. Arex was referred to in one scene in David Gerrold's October 1980 STAR TREK novel "The Galactic Whirlpool," but he had no dialogue. Also, on page 13 of A.C. Crispin's 1988 novel "Time for Yesterday," Admiral Kirk made a reference to a Commander Arex. This latter novel was set in the year 2283. Both Arex and M'Ress appeared in some late 1980's STAR TREK comics written by Peter David. They came on board with issue #37 (set right after STAR TREK IV) and stayed until #58. Some of these are collected in the graphic novel "Who killed Captain Kirk?" Arex most recently appeared, along with M'Ress, in STAR TREK: Gateways Book#6 New Frontier "Cold Wars" by Peter David, published in October 2001 and in STAR TREK: New Frontier #12 "Being Human" published in November 2001. A three-page biography of Arex was available from the Lincoln Enterprises 1974 catalog. This author considers this material semi-canon and it is included in this web site since virtually nothing of Arex's past was revealed in the Animated episodes. In his book, Beam Me Up, Scotty - STAR TREK's Scotty in his own words, actor James Doohan stated that he was very happy to be able to do so many voices for animated characters such as that of the alien character Arex.